For this example we use a vSphere 5.1 vCenter Appliance as it is fast and easy to install. Of course you can use a windows server for your vCenter and database, too. In your vCenter Client select “File” – “Deploy OVF Template” and point to the downloaded .ovf file. The wizzard will help you to configure the necessary settings – it is really easy and self explaining. Now you can use the “setup-wizzard” to configure the necessary settings. When you have finished you can connect to your vCenter appliance using your vCenter client. Here is a screenshot of our LABVC1. There are two clusters. 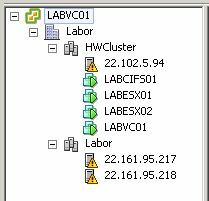 Cluster 1 is called HWCluster and contains the physical ESXi Host, the two virtual machines with the nested ESXi Hosts, an Openfiler to provide the NFS Shares for the nested ESXi Hosts and last but not least the vCenter Appliance itself.